A big band is a type of musical ensemble that usually consists of ten or more musicians with four sections: saxophones, trumpets, trombones, and a rhythm section. Big bands originated during the early 1910s and dominated jazz in the early 1940s when swing was most popular. The term "big band" is also used to describe a genre of music. One problem with this usage is that it overlooks the variety of music played by these bands. Stanley Newcomb Kenton was an American popular music and jazz artist. As a pianist, composer, arranger and band leader he led an innovative and influential jazz orchestra for almost four decades. Though Kenton had several pop hits from the early 1940s into the 1960s, his music was always forward looking. Kenton was also a pioneer in the field of jazz education, creating the Stan Kenton Jazz Camp in 1959 at Indiana University. Stan Getz was an American jazz saxophonist. Playing primarily the tenor saxophone, Getz was known as "The Sound" because of his warm, lyrical tone, his prime influence being the wispy, mellow timbre of his idol, Lester Young. Coming to prominence in the late 1940s with Woody Herman's big band, Getz is described by critic Scott Yanow as "one of the all-time great tenor saxophonists". Getz performed in bebop and cool jazz groups. Influenced by João Gilberto and Antônio Carlos Jobim, he popularized bossa nova in America with the hit single "The Girl from Ipanema" (1964). Jim McNeely is a Grammy award-winning jazz pianist, composer, and arranger. Focus is a jazz album recorded in 1961, featuring Stan Getz on tenor saxophone with a string orchestra. The album is a suite which was originally commissioned by Getz from composer and arranger Eddie Sauter. Widely regarded as a high point for both men's careers, Focus was described by Getz as his favorite of all his recordings. The pair would next collaborate on their soundtrack to the 1965 film Mickey One. Irving Sidney "Duke" Jordan was an American jazz pianist. Edward Ernest Sauter was a composer and arranger during the swing era. "East of the Sun " is a popular song written by Brooks Bowman, an undergraduate member of Princeton University's Class of 1936, for the 1934 production of the Princeton Triangle Club's production of Stags at Bay. It was published in 1934 and soon became a hallmark of the Princeton Tigertones, one of Princeton University's all-male a cappella groups. The standard is also sung by the Princeton Nassoons, Princeton University's oldest a cappella group. "It Don't Mean a Thing " is a 1931 composition by Duke Ellington, whose lyrics were written by Irving Mills. It is now accepted as a jazz standard, and jazz historian Gunther Schuller characterized it as "now legendary" and "a prophetic piece and a prophetic title." Gene Ramey was an American jazz double bassist. Rolf Billberg was a Swedish alto saxophone player active during the 1950s and 1960s. Moonlight in Vermont is a 1956 compilation album by jazz guitarist Johnny Smith, featuring tenor saxophonist Stan Getz. The material on the album was recorded between 1952 and 1953, and was drawn from two 10-inch Lps, both titled "Jazz at NBC", which were previously issued by the Royal Roost label. Titled for Smith's breakthrough hit song, it was the No.1 Jazz Album for 1956. It was popularly and critically well received and has come to be regarded as an important album in Smith's discography, in the cool jazz genre and in the evolution of jazz guitar. Notable songs on the album, which reveal the influence of Smith's experiences with the NBC Studio Orchestra, and as a multi-instrument musician, include the title track and the original composition "Jaguar". The title track, singled out for its virtuosity, was a highly influential rendition of a jazz standard that secured Smith's position in the public eye. Jazz Giants '58 is a 1958 album produced by Norman Granz featuring Stan Getz, Gerry Mulligan and Harry "Sweets" Edison, accompanied by Louis Bellson and the Oscar Peterson trio. Allan Botschinsky is a Danish jazz trumpeter and flugelhornist, composer, arranger, conductor, producer, and record label owner. Stan Getz and the Oscar Peterson Trio is a 1958 studio album by Stan Getz, accompanied by the Oscar Peterson Trio. Danish Jazz goes back to 1923 when Valdemar Eiberg formed a jazz orchestra and recorded what are thought to be the first Danish jazz records in August 1924. However, jazz in Denmark is typically first dated to 1925, when bandleader Sam Wooding toured in Copenhagen with an orchestra. This was the first time most Danes had heard jazz music. Some prominent early Danish jazz musicians include Erik Tuxen who formed a jazz band and later was named conductor of the Danish Radio Symphony Orchestra; Bernhard Christensen, an art music composer who incorporated jazz elements into his pieces, and Sven Møller Kristensen, who was the lyricist for many of Bernhard Christensen's pieces and who wrote a book on jazz theory in Danish. The Danish Radio Big Band, often referred to as the Radioens Big Band is a big band founded in Copenhagen in 1964. Diz and Getz is an album by Dizzy Gillespie, featuring Stan Getz. 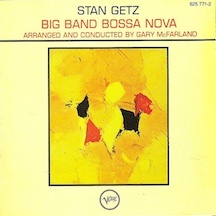 Big Band Bossa Nova is a 1962 album by saxophonist Stan Getz with the Gary McFarland Orchestra. The album was arranged and conducted by Gary McFarland and produced by Creed Taylor for Verve Records. This was Stan's second bossa nova album for Verve following Jazz Samba, his very successful collaboration with guitarist Charlie Byrd. Aarhus International Jazz Festival is an eight-day jazz festival in Aarhus, Denmark. It is held every year in July, August or September. The festival performs at the Aarhus Concert Hall, as well as many different venues across the city. Many concerts are played outdoors in the public space and are for free. Aarhus Jazz Festival has been awarded with the European Effe Label in 2017-2018. The 2018 festival was held from 14 to 21 July and the 2019 festival takes place from 13 to 20 July. West Coast Jazz is a 1955 album by Stan Getz accompanied by a quartet including trumpeter Conte Candoli. Getz recorded the album in California, where he was filming parts for The Benny Goodman Story, and appearing for a week at the nightclub Zardi's Jazzland. The musicians that accompanied him at Zardi's were chosen by Getz to make this album with him. Adventures in Time is an album by the Stan Kenton Orchestra featuring compositions by Johnny Richards recorded in 1962 and released by Capitol Records. ↑ Yanow, Scott. Trumpet Kings: The Players Who Shaped the Sound of Jazz Trumpet. p. 64. ISBN 0-87930-640-8. ↑ Gelly, Dave. Stan Getz: Nobody Else But Me. p. 102. This article about a Danish musician is a stub. You can help Wikipedia by expanding it. This article about a jazz musician is a stub. You can help Wikipedia by expanding it.